Nazionale returns once again in 2019, visually remaining entirely faithful to the original style, with this limited edition being produced in Indian Rainbow, Cinnamon and Shiny Lines celluloid. 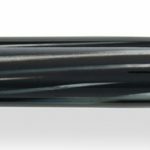 The pen’s design is enriched with black resin details on its junctions and blind cap, the material being the superior modern substitute for ebonite,made without sacrificing the correct “look.” Trim is necessarily in Sterling Silver. Its mid-section metal ring is engraved with the brand logo, while the pocket clip ends up with a decorative teardrop element, augmenting the vintage feel. What has changed is the nib, the most crucial functioning part of any pen, to ensure that its “write-ability” matches the expectations of the modern user. The new Nazionale, to be known as the Nazionale Flex, is so-named because it is fitted with a flexible nib that allows different types of hand-writing and calligraphic experiencesì to be performed with the same writing instrument by simply applying more pressure to the nib. 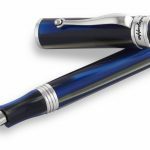 Montegrappa will issue only 100 Extra Fine and 100 Fine Nazionale fountain pens. Its collectability is therefore assured. A company born just before the First World War, Montegrappa is especially sensitive to the significance of that great conflict. 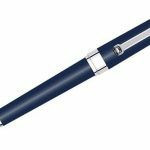 The company’s home region of Northern Italy was engulfed by it, while Montegrappa’s pens were part of the materiel, which participated in the confrontation and recorded the saga. 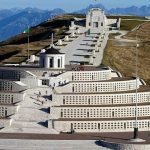 No less than the great Ernest Hemingway used a Montegrappa pen during his war-time exploits as an ambulance driver for the Red Cross in Northern Italy, as did John Dos Passos. 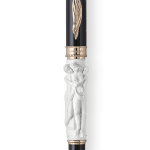 In Italian, the greeting changes to “Mia Carissima”, the name chosen for the commemorative pen produced to remind us of what our forebears endured 100 years ago. 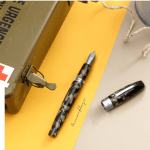 Beyond its most apparent experiences of – and direct connections to – the First World War, Montegrappa, too, wishes to dedicate the Mia Carissima Limited Edition of only 100 pens as a dramatic tribute to the three battles conducted in our beloved region and hometown. In this 2018 we have decided to revive our brand 753 that takes its name from the year of foundation of Rome. A recent study, revealing Rome to be the greenest city in Europe, has captured our attention and provided inspiration for this collection. The next step has been to choose the best material to evoke this record and we have unanimously selected the celluloid. No doubt the most loved material of all for its unique qualities.The shortage,the difficulty in the production, the curing and storage of the celluloid makes it very high value and sought after by all the fountain pen enthusiasts. 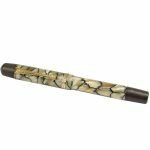 The well known Italian company Montegrappa is one of the oldest and most active Italian companies and has in stock a great variety of beautiful celluloids, so the dream has come true. The green malachite celluloid could not be more appropriate for our purpose. 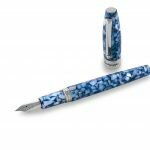 Then, I could not let this chance go by and begged Montegrappa to do something they have never made and I have always dreamt of: an Extra model with the celluloid section! First they were sceptic but, after a while, forced by my determination, they have accepted the challenge and enjoyed it. The result is now in front of your eyes in the photos attached. A beautifully crafted writing jewel made of an intense, deep marbled greeen celluloid enhanced by the sterling silver trims. Piston filling system and a special #8 size 18kt solid gols nib are the perfect attributes to match the beauty of the celluloid and the city! A classical floreal decor is engraved on both the nib and the cap band. 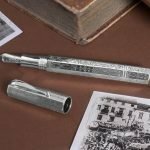 Limited to only 100 pieces the pen will available in the best Roman pen shops (Corsani and Novelli) beginning from mid November. We are happily waiting for your preorders!! Just contact us by email, Instagram or FB. 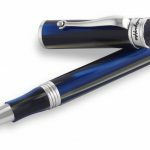 The successful collection Nazionale flex by Montegrappa ends its wonderful journey with this last precious version. The classical shape is enhanced by the lines of the Zebra celluloid. 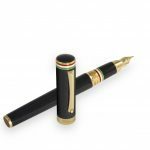 The pen features a piston filling system like the others and the heart of the collection is the 18kt solid gold nib with the flexible touch available in Extra fine and fine. Limited to only 100 pieces per nib size. A precious pen made to be used everyday! In our Montegrappa section you can take a look at the previous colors of the collection. 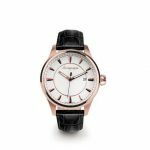 At a time when fine watchmaking has been recognised as an art, as much as it is a skill, the great horological figures of the past are enjoying new-found respect. Among those who contributed to the development of the machines that tell us the time was Bartolomeo Ferracina, a watchmaker and engineer from Solagna, a little village adjacent to Bassano del Grappa. While his projects involving hydraulics benefitted the municipalities in which he operated, it was his work with clocks for which Ferracina is celebrated. He produced models of many types and sizes, from pendulum clocks to those with automata, from table to tower clocks, including models with the indication of the lunar phases, the motion of the stars and the zodiac. He managed this even though limiting himself to applying existing knowledge, without having to invent any new mechanisms. His most notable contribution to the history of timekeeping was the reconstruction of the tower clock of Piazza San Marco in Venice, to the benefit of millions of tourists every year. 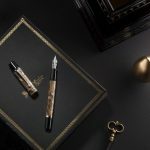 Concomitant with his stature, the pen collection dedicated to Bartolomeo Ferracina introduces a brand-new silhouette for a Montegrappa writing instrument. It is, appropriately, voluminous and as imposing as the immense tribute of Ferracina to the art of watch-making and to the science of engineering. 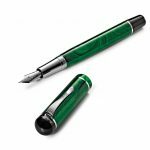 Offered strictly as a fountain pen, the Ferracina limited edition exists in a total of 300 pens. It is produced in a series of only 100 unique items in each of the three colours of pearlised celluloid: a rich Malachite Green, Shiny Circles made up of shades of grey and Indian Rainbow in beige hues, all with a Sterling Silver trim. Each pen is fitted with an 18k gold filigree-etched nib, available in the grades of Fine, Medium and Large. 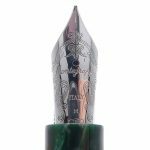 The nib’s filigree decoration is also found on the cap’s lower band, which also hosts the Montegrappa logo. The signature clip with the traditional rotating sphere reflects the sinuous curves of the new body form. 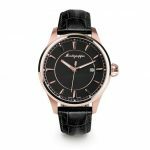 Aptly adorning the top of the cap is the perfect homage to Bartolomeo: it contains a functioning watch with a 16 mm diameter, which is detachable from the cap top. 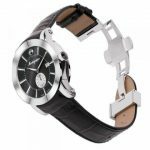 It contains a MIYOTA slim quartz movement, its octogonal-shaped crown positioned directly above the pocket clip. 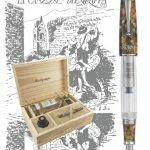 Time-keeping, mechanical ingenuity and manufacture taking place entirely in Bassano del Grappa, all in one pen: there can be no better homage to Bartolomeo Ferracina. Since 1912, for more than a century, Montegrappa has been manufacturing high-quality writing instruments in the same historic building in Bassano del Grappa, North East Italy. Inspired by a model born over 80 years ago, Extra 1930 was designed for people who love classic design, original colours and decorations. A manifestation of Montegrappa values, Extra 1930 combines the innovation of state-ofthe- art technical solutions with the tradition of its aesthetic approach. Extra 1930 is available in Turtle Brown Celluloid, Bamboo Black and Black & White and the new entries red and mediterranean blue celluloid. The pen trim is in Sterling Silver with piston filling systemand 18kt solid gold nib. Many nib sizes are available, if you wish for a special one not listed on our web site just inquire us:Stub,BB,OM and OB. 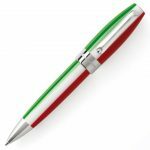 Montegrappa, Italy’s oldest manufacturer of fine writing instruments, is proud of its heritage and has honoured all manner of Italian cultural touchstones, from grappa production to soccer to the Tricolore. 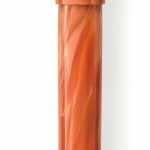 With the contemporary classic, the Fortuna pen, as its base, Heartwood pays homage to that most Italian of values: a love of organic materials and the gifts of Mother Nature. 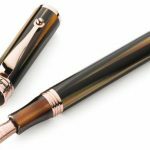 As Heartwood pens explore the relationship between man and nature, a precious link that must never be undervalued,it was immediately apparent that real wood should be the material of choice for barrel and cap. 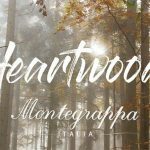 Joining the initial three versions of the Heartwood pen, chosen to represent the range and variety of woods that hold special appeal for the connoisseur and the aesthete, is another wood of deep importance and universal meaning. As much as any wood with a special significance for the great tradition of Italian woodworking, olive wood also embodies the essence of the Mediterranean. Its colour complements the hues of the teak, pear and walnut Heartwood pens that launched the series. It is the heart of the tree that produces the fruit which defines the region’s diet, which accounts for its inhabitants’ health and longevity. More relevant in this era is the greatest historical and literary import of the olive branch: it stands for peace. With its light, golden-brown colour and fine grain, the Heartwood in olive exudes both timelessness and modernity. The natural olive tree wood used for the caps and barrels is complemented perfectly by trim in satin stainless steel,its cool hardness contrasting with the wood’s soft, organic textures. 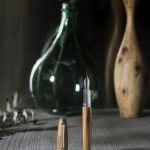 As with the existing Heartwood pens, each one the beneficiary of Italian excellence in working wood for furnishings, in boats and musical instruments, the Heartwood Olive will be offered as a fountain pen, rollerball and ballpoint. 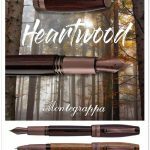 With one’s own personal olive branch always to hand, the newest Heartwood pen reminds us that – even in an age of wireless communications and high-tech materials – handwriting with instruments fashioned from elements provided by nature will always embody the finest qualities of humanity. Inspiration comes to Montegrappa from a variety of sources and places and events and objects. All celebrate some aspect of life, and what enriches it. In the wake of the great success of the Montegrappa Mule line, inspired by a famous cocktail, they looked again at another favourite tipple, the Blue Blazer. An enticing mix of scotch, boiling water and powdered sugar, the Blue Blazer earns its incendiary name from the theatre that accompanies it: the drink is set alight. Celebrating its 155th birthday this year, the Blue Blazer is said to be the first cocktail to undergo the touch of the flame. Most distinctively, the drink is prepared with two large tankards, between which the stream of flame travels. 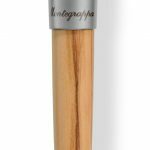 The Montegrappa Blazer is based on the Fortuna shape, but with its cap and body made, appropriately, of fire-burnished stainless steel with a vintage-looking brushed silver trim. 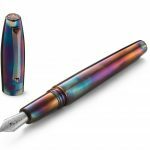 The polished steel surface of the pen barrel and cap basks in bluish, iridescent shades, just as a heated metal would do. As a companion to the Mule, the Montegrappa Blazer will appeal to those who value authenticity, craft and a good, stiff drink. 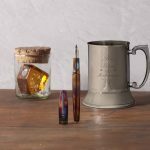 To assist in this pursuit, every Montegrappa Blazer pen will be delivered with a special Blazer tankard as a gift, as is traditionally used to prepare the drink and customized with the new logo. 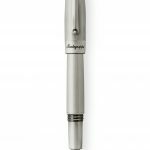 The Montegrappa Mule Fountain pen has a stainless steel nib and uses a cartridge/converter filling system. 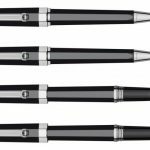 Italy’s first pen producer, Montegrappa, began manufacturing pens in 1912 in its factory in Bassano del Grappa in Italy. 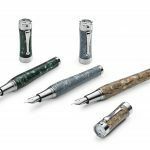 Utilizing natural celluloid and precious metals,Montegrappa combines traditional methods such as die-casting with more recent innovations as low-relief engraving to form their precious art objects. 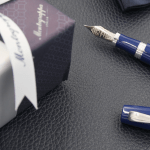 Whether Montegrappa use colors reminiscent of the master painters or ornamentation suggestive of Baroque palaces, the Italian heritage and romance is infused into each product. 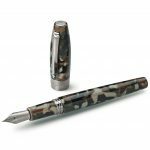 Called “The Camouflage Collection”, the new pen is available in the three main forms of fountain pen, rollerball and ballpoint. The earth-tone camouflage patterns follow genuine military design criteria, realised in resin with brushed stainless steel trim. The fountain pen is both cartridge- and converter-fed, with nib in stainless steel bearing the octagonal Montegrappa motif etching, known as “Filigree”. Available as Fine (F), Medium (M) and Broad (B). As with any military issue, the accessories are a major part of the experience. Every Camouflage pen is supplied in a tin field box, resembling a medic’s first aid kit, and the set comes with dog tags. If you’re in touch with your inner Rambo, this pen has your name – and serial number – all over it. 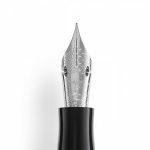 Using its modern classic, the Fortuna, as the base for an all-new model, Italy’s most revered manufacturer of writing instruments, Montegrappa, has released its second “mule”. Following the copper-clad Mule, launched last year and named after the famous cocktail, is the Silver Mule, an icy-cool, sleek alternative to the fiery warmth of its predecessor. Entirely silver-plated, the Silver Mule offers a uniquely tactile experience, as its complete surface area – cap, body and the trim – has been vertically brushed and thus afforded a whiff of antiquity. This complements the clean, minimalist form, which recalls spacecraft of 1950s science fiction book covers and dream architecture of the 1930s. This marriage of modern and retro endows the Silver Mule with unisex appeal, a blissful combination of both feminine and masculine qualities. has embraced everything from ornate commemorative pens to minimalist devices devoid of any protrusions. Art Deco attitude, its colours evoking the era with exquisite tints and shadings. 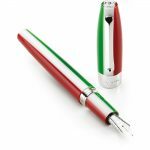 Now highly collectible, the Nazionale has inspired Montegrappa to revive it with a key feature not available eight decades ago. 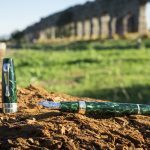 Nazionale returns, visually remaining entirely faithful to the original style, with this limited edition being produced in Marble Green celluloid, precisely as it was in the 1930s. 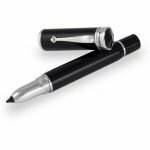 The pen’s design is enriched with black resin details on its junctions and blind cap, the material being the superior modern substitute for ebonite, made without sacrificing the correct “look.” Trim is necessarily in Sterling Silver. Its mid-section metal ring is further engraved with the brand logo, while the pocket clip ends up with a decorative teardrop element, augmenting the vintage feel. by simply applying more pressure to the nib. For enhanced flexibility, the nib is made of 14k gold, and will be made available only in the grades of Extra Fine and Fine, as it accomplishes the rest on its own, according to how it is applied. The nib’s cut-out shoulders offer comfortable curving, for an enhanced writing experience. Also in keeping with the era during which the Nazionale was born, which predates cartridges, this fountain pen’s filling system is piston-only. 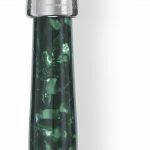 Due to severely limited remaining quantities of the material that forms the Nazionale’s cap and body,Montegrappa will issue only 100 Extra Fine and 100 Fine Nazionale fountain pens. Its collectability is therefore assured. To honour the world’s greatest artists, writers and thinkers, Montegrappa created the Genio Creativo series of pens. 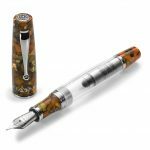 Each represents the achievements of an intellectual or artistic giant in a writing instrument that embodies the spirit of a specific work, as interpreted by Montegrappa’s artisans. Joining writer and philosopher Kahlil Gibran and the artist Vecellio Tiziano, known as Titian, is the sculptor Antonio Canova. Antonio Canova (l November 1757 — 13 October 1822) was an Italian sculptor famous for his work in marble. Often regarded as the greatest of the neoclassical artists, his work was inspired by the Baroque and the classical revival, but made more contemporary by dispensing with the melodrama of the former and adding a human element to the latter. solid 18k gold trim, representing the number of collaborators who worked with Canova. 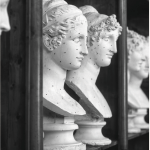 Recalling the visual presence of Canova’s sculptures, the marble element is naturally grey. According to legend, Canova would pass over the freshly-chiselled, once-white stone with a cloth soaked with water, the same one used to wash the sculpting tools. The stone would absorb the dirt and acquire a more natural look. drape with which the artist used to clad his models, while the bronze or gold trim enriched with decorative motifs often crowning antique amphorae. The Genio Creativo Canova Fountain pen is piston-fed, and the nib is in 18k gold, engraved with the same symbol as the cap top, signifying the heraldic coat of arms of the family. Most popular with Italian woodworkers, and found in furnishings, in boats and even musical instruments are woods with distinctive grains and colours. One pen is fashioned of the darkest teak, walnut provides a pen with a nutmeg colouring while pear wood delivers a reddish cast. Offered as fountain pens, rollerballs and ballpoints, Heartwood pens remind us that – even in an age of wireless Communications and high-tech materials – handwriting with instruments fashioned from elements provided by nature will always embody the essence of humanity. 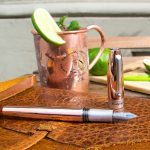 The Montegrappa Copper Mule Fountain Pens were created after the vodka drink, the Moscow Mule. This cocktail is made from vodka, a spicy ginger beer and lime juice and served in a copper mug. 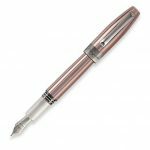 This Montegrappa Fortuna fountain pen features a copper barrel with brushed stainless steel accents, creating an elegant yet modern look. ​The pen features a super smooth broad steel nib, and accepts cartridges or a converter (included). The copper will patina on the pen over time (unless polished – cloth included! ), creating a unique look to you. 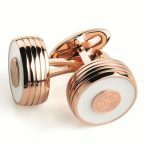 The first release of this Copper Mule pen will come with a matching copper mug for you to make your own “Montegrappa Mule”. Because the pen is made from metal it is a heavy duty pen but balanced with more weight at the front of the pen for a more comfortable writing experience. After the great success of the Quincy Jones limited edition luxury marker, Mintegrappa is proud to announce the new issue of this regular edition: Marker Ducale! This new kind of writing instrument is dedicated to show business people or those who work in meetings with blackboards or graffiti Arts fans. 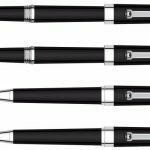 The shape of the pen is taken from the classic black resin Ducale collection.It fits a standard high quality Sharpie refill. Indelible,perfect for signatures and drawings. 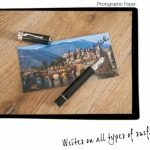 It writes on all types of surfaces even the less usual as glass,plastic, wood and stone! 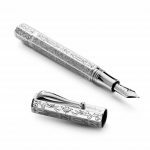 Collection Ducale :for Montegrappa – based for over a century in its home of Bassano del Grappa and located a mere 80km from Venice – the proximity of this remarkable city and the grandeur of its architecture add to the significance of a pen whose form was inspired by both. A generously-sized writing instrument, demonstrating perfect balance, the Ducale is a joy to hold and a delight with which to write. Consisting of a rollerball, a ballpoint and a fountain pen, Ducale pens are manufactured from black resin and trimmed with a choice of palladium or rose gold-plated, or in a pearly Emperador Brown resin, offered with rose gold-plated trim. 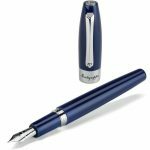 The fountain pen is available with fine, medium or broad nibs,cartridge/converter system as best suits the writing style of the user. 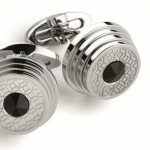 As with all Montegrappa pens, the clip terminates in the signature ball to facilitate easy removal from or insertion into one’s pocket. Prices of the collection from € 245,00 of the brown fountain pen to € 180,00 of the black ballpoint. 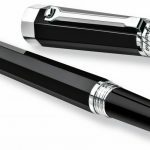 The classic collection of Montegrappa, entirely made in acrilic shiny black resin with octagonal shape and rhodium trims. 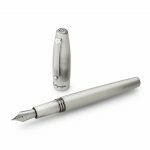 The fountain pen is fitted with an 18kt solid white gold nib, filling system cartridge and converter (€ 415,00). 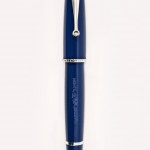 Tha collection is completed by the rollerball (€260,00),ballpoint and mechanical pencil (both € 230,00). The newest addition to the famous Venetian house has the goal of becoming the true highlight of the catalog. 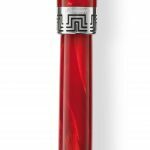 The shape is inspired by the legendary motif that distinguishes the products Montegrappa: the octagon, example of geometric perfection! The pen is made of three new colors of celluloid. 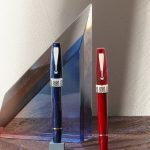 Anyone with a modicum of familiarity with the world of fountain pens knows the production difficulties of using this noble material reflections unique color. Produce today, then, the new colors, corresponds to an extremely brave challenge from an economic standpoint and costruttivo.La shape faceted octagonal celluloid makes even more fascinating along with silver trim 925%, the new group scrttura extra oro18kt conducted with Ebonite and the piston filler. 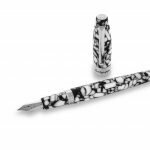 The ” lucky ” collection Montegrappa black resin sinuous and elegant . Steel nib and measures available in fine, medium and largo.Caricamento cartridge and converter . 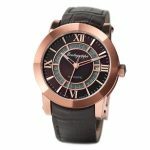 3 variations in the color of the metal details : rhodium , ruthenium and rose gold . Last new addition in the collection of white ( White Fortuna , elegant ) and blue ( pink gold or rhodium finish ) . 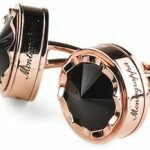 Basic but fascinating collection by Montegrappa. Precious resin in different colours, palladium trims, steel nib available as fine medium and broad.Prices starting from € 125,00 (ballpoint),160,00 (roller ),180,00 fountain pen cartridge/converter filling system.